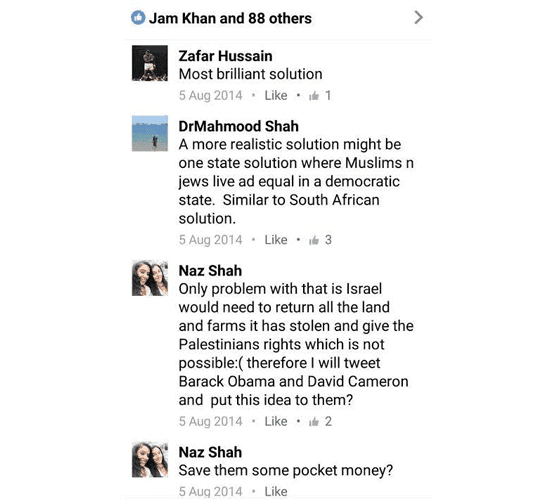 Muslim Labour MP Naz Shah has suggested that the “problem” of Israel can be “solved” by the “transportation” of Israelis out of the Middle East. Apologising for any offence given, she has now resigned as the Shadow Chancellor’s Parliamentary Private Secretary (PPS). In the comments below, she further mused: “Only problem with this is that Israel would need to return all the land and farms it has stolen and give the Palestinians rights which is not possible:(,” adding that she would “tweet David Cameron and Barack Obama” to suggest the plan. Ms Shah has now issued an apology via Guido Fawkes, stating: “I deeply regret the hurt I have caused by comments made on social media before I was elected as an MP. “I made these posts at the height of the Gaza conflict in 2014, when emotions were running high around the Middle East conflict. But that is no excuse for the offence I have given, for which I unreservedly apologise. Although Ms Shah has, as she says, publicly opposed anti-Semitism – last week a Conservative Councillor in her own constituency was suspended by his party after she accused him of making anti-Semitic comments – her own track record in the Commons and elsewhere betrays some disturbing views of her own on Jews and the State of Israel. The JC has uncovered a tweet, also posted in the summer of 2014, in which she linked to an article claiming that Zionism was being used to groom Jews into covering for Israel’s “inhumane” policies. “Zionism used this and the colonial period to groom other modernised men and women of Jewish descent to exert political influence at the highest levels of public office by using the guilt of the pogroms and offered a solution to the ‘Jewish Question’ in Europe,” the article’s authors insist. In another Facebook post, linking to a poll on whether Israel was committing war crimes, Ms Shah urged her followers to vote as “the Jews are rallying”. – On March 15 of this year she argued in favour of allowing councils to engage in the Boycott, Divestment and Sanctions [BDS] movement through their procurement procedures, saying: “BDS is about upholding international law.” The movement was founded by pro-Palestinian groups who accuse Israel of the colonisation and occupation of Palestinian land, particularly in the Golan Heights. When she was asked whether it was right to arrest children who have been responsible for the deaths of others, she responded that being detained for throwing a rock was “disproportionate” and insisted that there “is no evidence” that Palestinian children have caused deaths by throwing stones. The historian Rafael Medoff has identified at least 14 incidents of people being killed by Palestinian stone throwers, including five-month-old Yehuda Shoham, who was struck in the head by a rock in 2001, and four-year-old Adele Biton, who died from injuries sustained when the car her mother was driving crashed after being hit by a barrage of stones. Three Arabs who were mistaken for Jews have also been killed by Palestinian rock-throwing. Ms Shah currently sits on the Commons’ Home Affairs Select Committee, which is due to launch an inquiry into Anti-Semitism in the UK. But leading campaigners against anti-Semitisim have warned that they will struggle to take the inquiry seriously if Ms Shah remains on the committee panel. Jonathan Sacerdoti, Director of Communications at the Campaign Against Anti-Semitism, said: “One cannot simply apologise for ‘any offence caused’ and expect all evidence of gross and brazen antisemitism to disappear. “Once again the Labour Party has been revealed to have within its ranks people who express extreme prejudice towards Jewish people in their public statements; once again the party has failed to find these statements itself, and reject those who freely and willingly express them. How can we believe Labour when it says it takes the problem of Jew-hatred seriously when it repeatedly defends anti-Semitic MPs. It seems that Jeremy Corbyn’s anti-racism policy only operates when convenient. 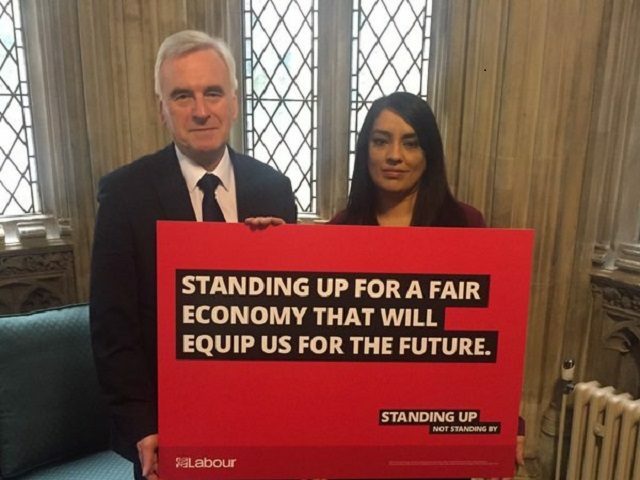 The Campaign Against Anti-Semitism has launched a petition calling for Ms Shah to be taken off the anti-Semitism inquiry and expelled from Labour. Conservative MPs have also demanded that Labour disassociate themselves from her immediately by withdrawing the whip, to prove that they are as serious about tackling anti-Semitism within their ranks as the leadership claims to be.